Peradaban Lembah Sungai Indus berada sepanjang Sungai Indus di Pakistan sekarang ini. Puing Mohenjo-daro difoto di atas merupakan pusat dari masyarakat kuno ini. 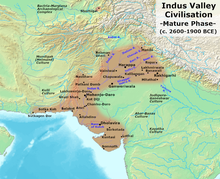 ^ "Indus Valley 2,000 years older than thought". Basham, A. L. (1967). The Wonder That Was India. London: Sidgwick & Jackson. hlm. 11–14. Hiltebeitel, Alf (2011). "The Indus Valley "Proto-Śiva", Re-examined through Reflections on the Goddess, the Buffalo, and the Symbolism of vāhanas". Dalam Adluri, Vishwa; Bagchee, Joydeep. When the Goddess was a Woman: Mahabharata Ethnographies – Essays by Alf Hiltebeitel. BRILL. ISBN 978-90-04-19380-2. Masson, Charles (1842). "Chapter 2: Haripah". Narrative of Various Journeys in Balochistan, Afghanistan and the Panjab; including a residence in those countries from 1826 to 1838. London: Richard Bentley. hlm. 472. Diarsipkan dari versi asli tanggal 30 September 2007. Wikimedia Commons memiliki media mengenai Indus Valley Civilization.